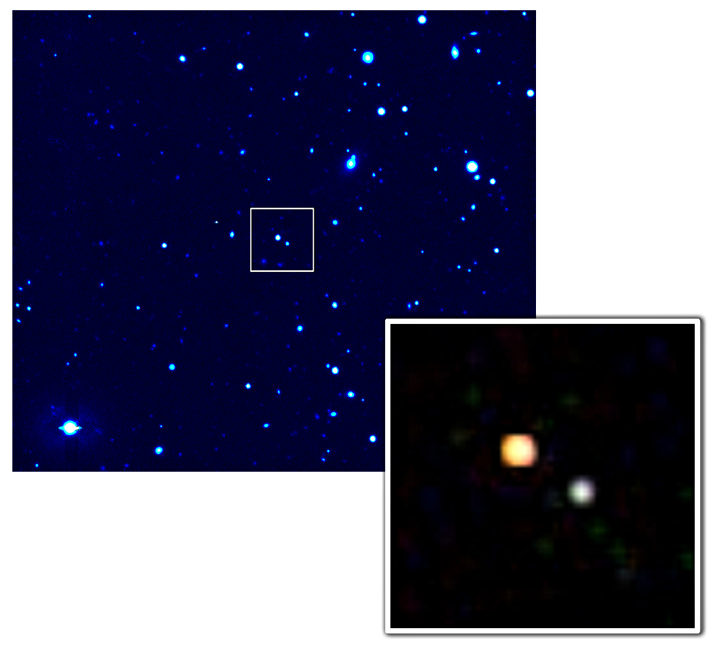 The Chandra image of the twin quasars Q2345+007 A, B shows that they are not identical twins. This means that it is unlikely that they are an optical illusion, rather, they were probably created by merging galaxies. When galaxies collide, the flow of gas onto the central supermassive black holes of each of the galaxies can be enhanced, resulting in two quasars. The light from the quasar pair started its journey toward Earth 11 billion years ago. Galaxies were about three times closer together then than they are now, so collisions were much more likely. Quasar pairs that are seen close to one another on the sky and are at the same distance from Earth often turn out to be an illusion as part of a gravitationally lensed system. In these cases, the image of a single quasar has been split into two or more images as its light has been bent and focused on its way to Earth by the gravity of an intervening massive object like a galaxy, or a cluster of galaxies. The quasar pair Q2345+007 A, B was thought to be such an illusion because of the remarkably similar patterns of the light, or spectra, from the pair at both optical and ultraviolet wavelengths. However no intervening galaxy or cluster has been found for this pair, leading to the speculation that the gravitational light-bending might be caused by a new type of cluster that contains hot gas and dark matter, but no stars. Such a “dark cluster” would be invisible to optical and ultraviolet telescopes, but would be detectable in X-rays. The Chandra X-ray images showed no evidence for a massive dark cluster. Further, the X-ray spectra of the two quasars were distinctly different, supporting the idea that they are distinct objects, rather than a mirage. 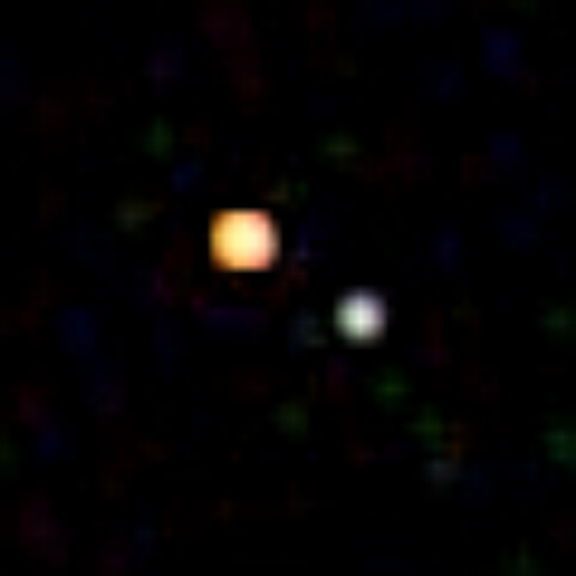 Scale Image is 30 arcsec per side. Coordinates (J2000) RA 23h 48m 19.6s | Dec +00° 57' 21.10"